Imagine if a literature major, an art major, and an architecture major were all sharing the same cramped dorm room and were deciding on how best to decorate their shared living space. Could one piece of artwork satisfy all three of them? 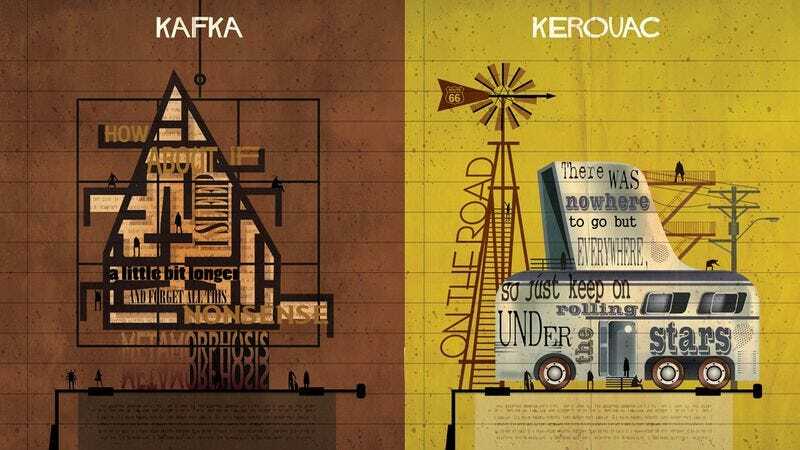 Yes, potentially, if it came from Spanish artist Federico Babina’s Archiwriter series. For these 27 images, Babina has taken certain titles and quotes associated with famous authors, including William Shakespeare and Ernest Hemingway, and affixed them to architectural designs, as if the writers themselves were building physical structures with their words. To be sure, this is a high-concept idea, which may be difficult to grasp without actually viewing some of Babina’s work. For example, here is Babina’s symbolic, impressionistic treatment of Charles Bukowski: a forlorn-looking hovel with lonely fire escapes and tacky neon signs, all rendered against a puke green backdrop, perfect for aspiring alcoholics. The Shakespeare one is considerably more regal than that, albeit splattered in blood. All that upward mobility comes with a steep price, after all. The image for Richard Wright is appropriately grim and oppressive, with the logo for Black Boy spelled out in barbed wire. Note, too, the fire and the iron bars. The lined paper backgrounds and typewriter keys remain a constant from image to image in Archiwriter, reminding the viewer of the sometimes grueling physical process of writing. The images also have a distressed look to them, as if their creator threw them across the room in frustration once or twice. For anyone who cannot decide on a particular author, there is a collective image that gathers all 27 authors into one community called “Archiwriter City.” Oh, to corner the market on whiskey and cigarettes in that town, huh?